A program that assists with the development of fundamental motor skills such as coordination, balance & agility. Positive promotion of a healthy lifestyle & love of sport at a very early age to improve personal and academic leaning. The development & growth of self esteem, self confidence, cooperation & persistence. Now at your childcare centre! Kids’ are taken on a fun new adventure week using modified equipment to make learning EASIER & MORE FUN! A great way for kids to learn the fundamental & perceptual motor skills like throwing, catching, balance and hand-eye coordination through fun game play! Our programs are for boys and girls aged 3-5 years and prices start from only $9 per child per week! 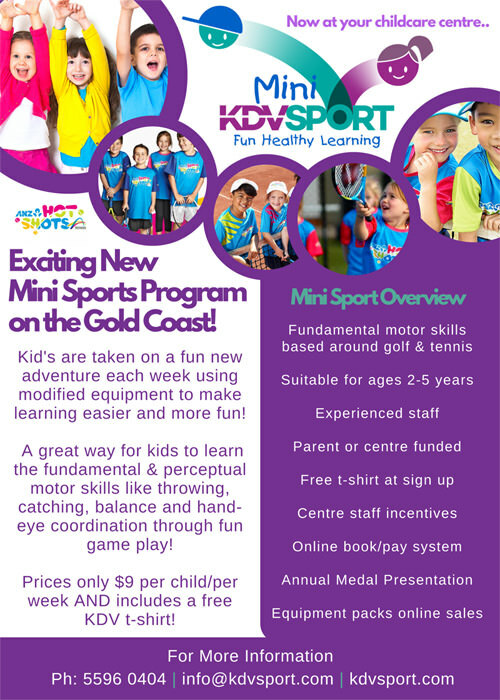 KDV Mini Sport Staff offer a FREE promo session for all students aged 3-5years. We then send flyers home to the parents and place a sign-up sheet and promo sign at the centre entrance. KDV mini sport then deals directly with the families for bookings and payments. Families are charged $9/ session (family discounts available) via term invoice or direct debit. The program generally runs through the public school term dates (10 week blocks). Each time a child renews for another term they receive a FREE gift (T-Shirt, Bucket Hat, Drink Bottle or Bag). Students are only billed for sessions they attend. Missed sessions can be credited towards the next term. 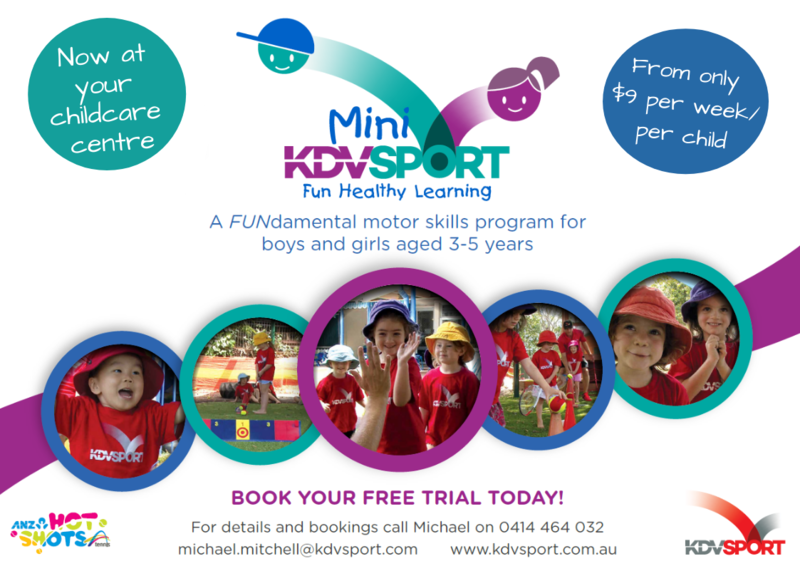 KDV Mini Sport offer a FREE promo of our program for all students aged 3-5 years. Your centre can then book a KDV Coach to run regular weekly sessions (up to 1 hour). These sessions can accommodate up to 24 children per session (2 groups of 12). Normally aimed at the Pre-school and Senior Kindy student rooms. Longer or shorter customized sessions can be arranged.